Cubist painting puts a lot of people off, and, in a way, that's the point—but not in some sophomoric "let's shock our parents" way. 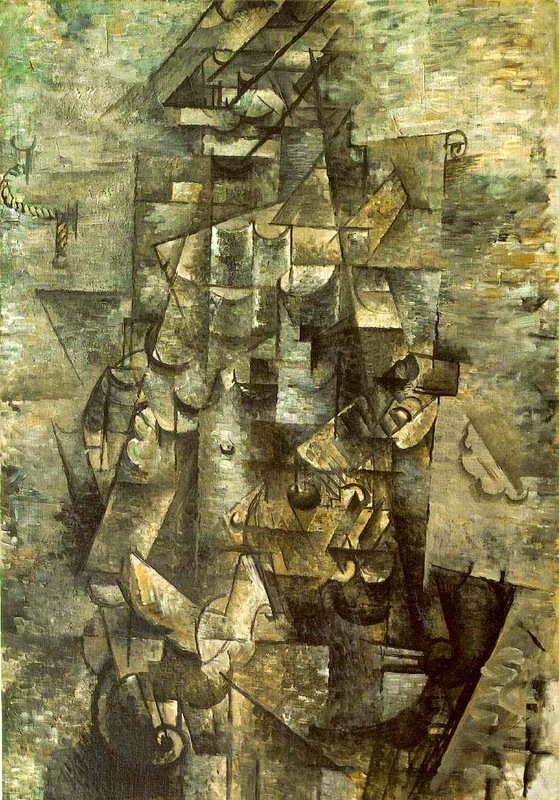 One of the main accomplishments of cubism is the way it dislocates the viewer, but to understand just how this works it's probably best to take a look at the highly developed mode of painting that cubism rejects—the kind of representational painting that relies on single point perspective. It's not really a coincidence that this sort of painting comes into being in the Renaissance, reaches a zenith in the seventeenth and eighteenth centuries, and only really begins to be challenged in the nineteenth century. Consider how the dates co-ordinate so well with what Michel Foucault, in The Order of Things, calls "the classical episteme." This episteme, or way of organizing knowledge —incipient in the Renaissance, dominant around the mid-seventeenth century, and continuing on through late eighteenth century—reflects the ideology of absolutist monarchies. The stress is on order, centralization, and sovereignty in all things: in politics, in theology, in economics. Aesthetics is no exception: the Palace of Versailles and its gardens give architectural and spatial expression to the notion of a grand and centralized scheme, and order based on the location and prestige of the sovereign. The king's inner chamber, and, in the final analysis, the king's body are the center of a world that points toward, and radiates out from, his presence. The single point perspective that dominates representational painting during the classical era also reflects the values of centralization and sovereignty. 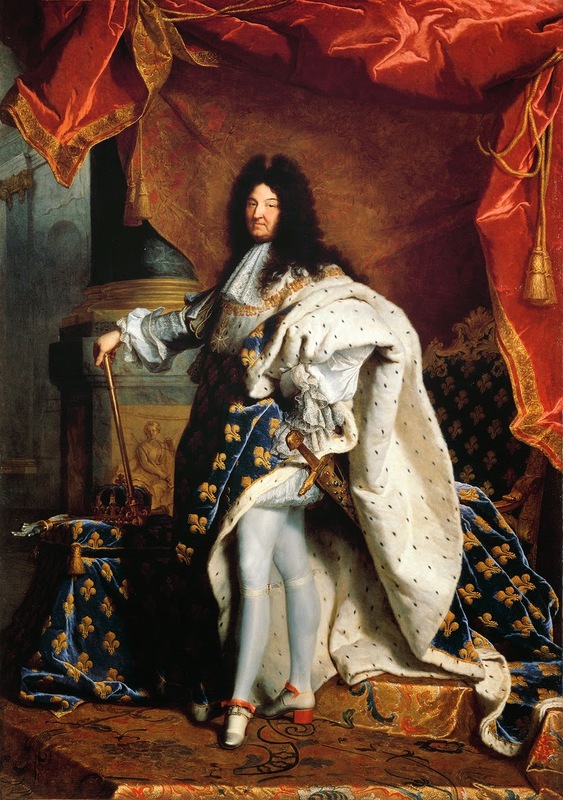 We see this not only in grand portraits that assert the power of absolute monarchs, such as Hyacinthe Rigaud's famous portraits of Louis XIV, but in the formal underpinnings common to so many paintings of the classical episteme. As Christopher Kul-Want puts it, "In painting during this period (especially in southern Europe), the subject stands literally and metaphorically before the pictured world like an omnipotent God. In Raphael's School of Athens, for example, a central space is reserved for the subject, who is both viewer and addressee of the painting." As a viewer, you know where you stand in relation to the image, and it's a place of command and access: everything opens up, available to you and directed at you. In a sense, you complete the scene, and stand at the point that gives it order. 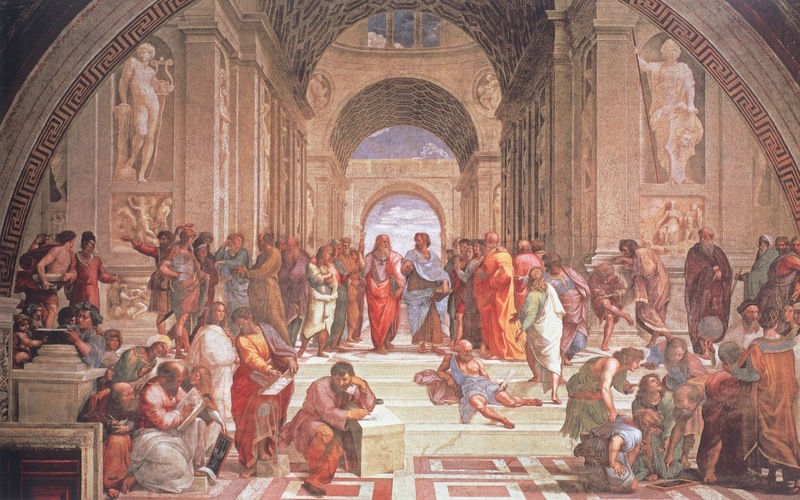 In the case ofThe School of Athens, you stand directly before the greatest and most central of philosophers, as if to command their conversation and interrogate them about whatever subject you wish. 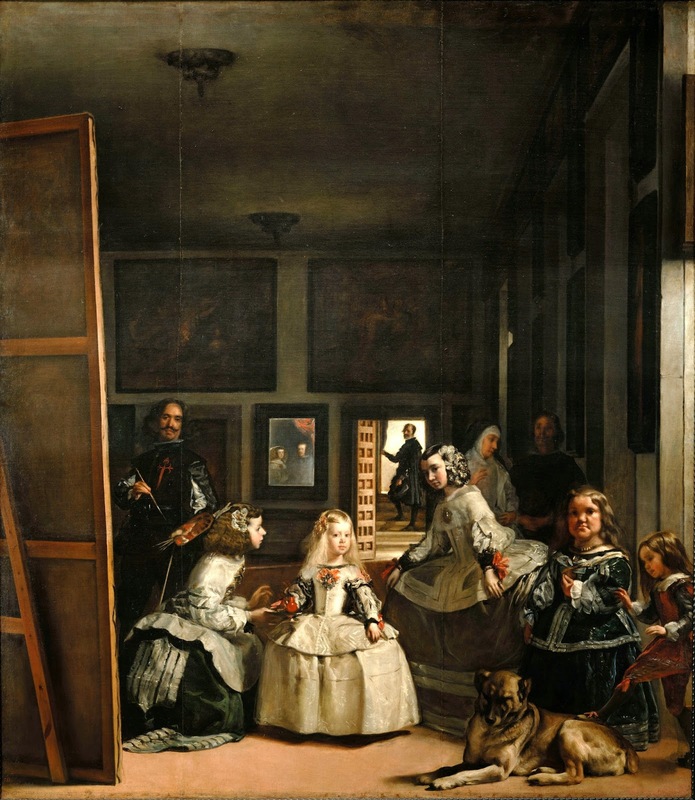 In The Order of Things Foucault discusses Velázquez's Las Meninas as a culmination of the classical episteme in painting. Here, we take the position of the sovereign: the mirror in the back reflects the images of King Philip IV and Queen Maria Anna — and we, as viewers, soon realize that we stand, quite literally, in the place of the sovereign. We command the creation of pictorial space, since Velázquez paints himself here as someone who is in the process of painting a commissioned portrait of us (the little girl is visiting us while we sit for this portrait). We are also, by virtue of the mirror with our reflections in it, at the center of pictorial space. And, most importantly, we are in the privileged place of the spectator for whom all of the visual elements are ordered and displayed. There's a lot going on in Velázquez's painting but, among other things, Las Meninas is a comment on the nature of pictorial space, and on the privilege granted to the viewer of single-point perspective representational paintings. In this kind of painting, we, the viewers, are kings, and gaze with mastery over all we survey. There's a long, slow breakdown of the classical episteme, and many of our cultural landmarks are both symptoms and causes, of that breakdown. Consider Isaac Newton's Principia: Newtonian space is a far more potent challenge to the classical episteme than Galileo's decentering of the earth in favor of the sun ever was. If space is the neutral, ever-extending field Newton theorized, it lacks a center, and therefore is impossible to hierarchize: every point is as significant as every other point. Or consider Voltaire's "Micromégas," a story in which a centuries-old, 20,000 foot tall creature from an enormous planet orbiting Sirius visits the earth, along with his 6,000 foot companion from Saturn. Their contempt for the tiny inhabitants of our planet, and the philosophical reflections that stem from differences of scale in space and time serve to displace our sense of our own centrality and sovereignty. A more familiar example of the relativizing of our perspectives and values comes in Swift's Gulliver's Travels, which helps spell the death knell for the theology and political thought of the classical episteme—even though Swift himself was none too happy about the decline of the old values. But I digress. This is about Cubism. And one thing that Cubism does is to displace the viewer from the privileged space he occupied during the classical episteme. 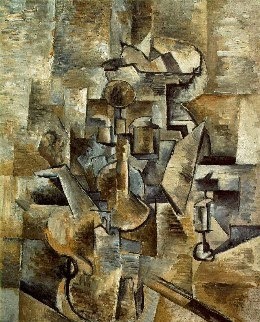 Whether it's a matter of presenting a profile view with both eyes visible as if in a frontal view, or a matter of representing the many different planes that might form the entry point into a painting, Cubist paintings find ways of not letting you assume a steady place from which the represented objects can be seen clearly. In the Cubist world, we're no longer able to see from a position of sovereignty and command: we're no longer that important. What is more, we're forced to confront the fact that it is not possible to survey the world from a vantage point that makes everything available to us. Every imaginable perspective is partial, every perspective leaves something out. Things in themselves are visible to us only in bits and pieces, in stolen glances. Cubism denies Matthew Arnold's old ideal "to see life steadily and see it whole," and asserts something more like what E.M. Forster asserts when, in Howards End, he tells us "it is impossible to see modern life steadily and see it whole." We can, like Forster's Mr. Wilcox, see it steadily but in a very limited fashion, or we can, like Forster's Margaret, see it whole. Cubism is a kind of Margaret, offering the whole only by shaking it up into bits, and placing us in an unsteady position.